It’s true that individual investors could have benefited from alternative investments. The overlapping data for hedge funds, private equity and real estate run from 1990 to September 2017. A traditional 60/40 portfolio of U.S. stocks and bonds — as measured by the S&P 500 Index and the Bloomberg Barclays U.S. Aggregate Bond Index — returned 8.2 percent annually during that period, including dividends. Adding a 10 percent allocation to each of the three alternative investments — as represented by the HFRI Fund Weighted Composite Index, the Cambridge Associates US Private Equity Index and NCREIF Fund Index Open-End Diversified Core Equity, respectively — would have added 0.7 percentage points a year. And thanks to hedge funds’ ability to short stocks and the fact that private assets aren’t subject to the whims of public markets, adding alternatives would also have resulted in smaller declines during each of the last two bear markets. Which raises the question: Why weren’t alternatives available to individual investors sooner? The answer is that no one needed their money. 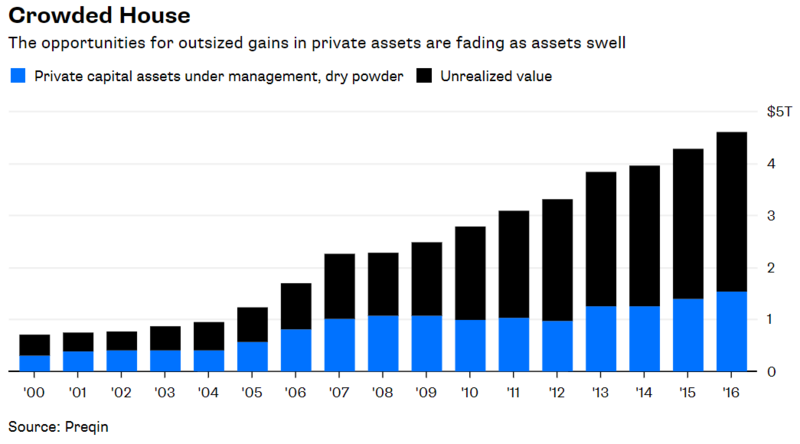 In the early days of alternative investments, plenty of institutional investors were eager to throw millions of dollars at them. And for good reason: There were more opportunities for big payoffs than money chasing them. Consider that there were only 610 hedge funds and funds of hedge funds managing $38.9 billion in 1990, according to HFR. That number swelled to 9,754 funds managing $3.2 trillion by the end of 2017. It’s no accident that the HFRI Index returned 18.6 percent annually from 1990 to March 2000 but only 6.1 percent from March 2009 through April, despite that both periods coincided with historic bull markets. 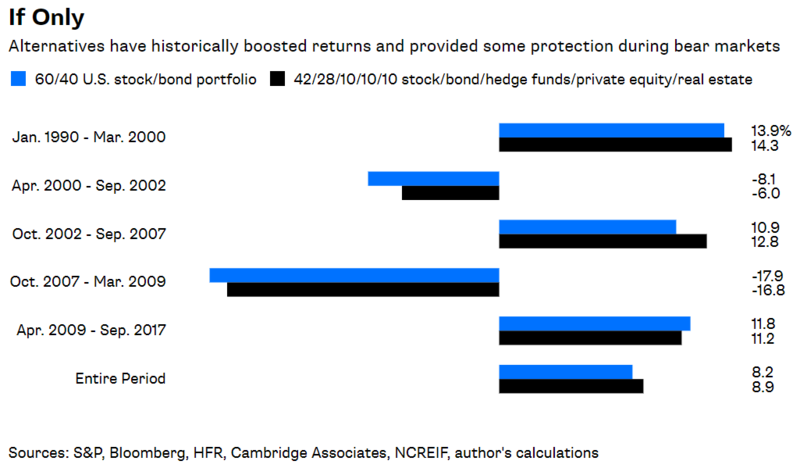 With hedge funds crowded and returns sagging, money isn’t flowing to them like it used to. 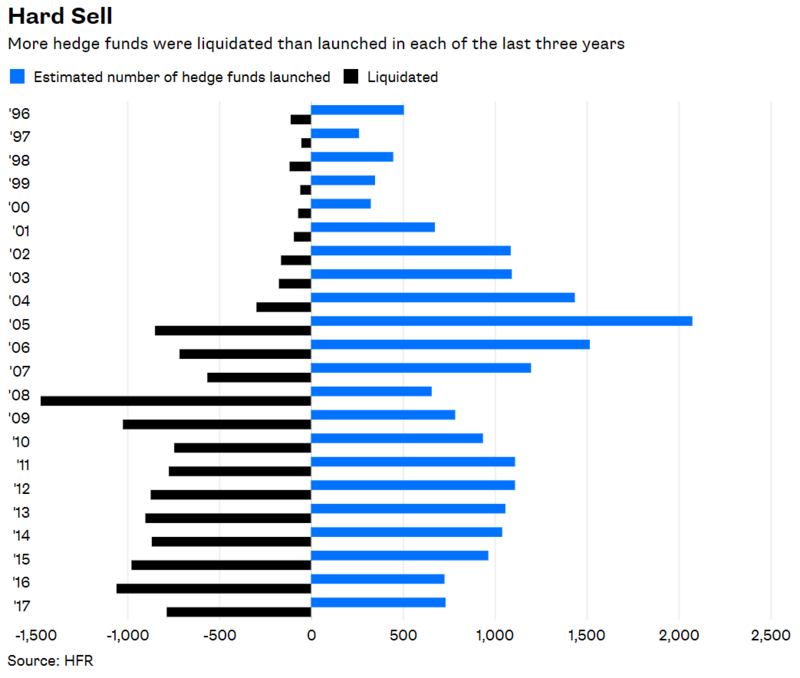 Hedge funds experienced a net outflow of $1.5 billion over the last 10 years through 2017, and more funds were liquidated than launched last year for the third consecutive year. It’s a similar story for private assets. There were 415 private capital firms in 1990, according to Preqin. That number jumped to 8,001 firms managing $4.6 trillion by the end of 2016. Here, too, size has taken a toll on performance. The Cambridge Associates index returned 21.4 percent a year from 1990 to March 2000, but dipped to 14.8 percent from April 2009 to September 2017. Meanwhile, private equity valuations continue to rise and capitalization rates for private real estate are dropping. That points to more modest returns going forward and inevitably waning interest from institutional investors. Enter individual investors, many of whom have no experience with alternative investments and are scarcely aware that their best days are most likely in the history books. One reason institutional investors seem so smart is that they often get the first crack at the best investments. But individuals can get smart, too. The next time a fancy bank offers them some also-ran alternative investments, they should demand to see what’s on offer to the $10 million-and-up crowd.